Auto Shocker Removes Any Car Odor including Cigarette Smoke. How Car Dealerships Remove Cigarette Smoke from Used Cars? There really is nothing better than having a well-maintained car. Apart from providing a smooth joyride on the road, well-kept cars offer a high resale value. You’ll probably fetch more on a car kept in good condition since buyers will be willing to pay more. Keeping your car in pristine condition is not just about looks. You need to keep your interiors clean and crisp - not only from dirt and stains, but from persistent odors as well. And that is where the greatest challenge lies - de-skunking your car. If you’re tired of emptying several canisters of air freshener bottles to no avail, then perhaps it’s time to let the pros handle it. At Biocide Systems, we provide an affordable, efficient and eco-friendly odor removing agent - the Auto Shocker. Odor tends to absorb in and stick to your inner car fabrics, vinyl, leathers and carpet. Even the best air fresheners only succeed at removing the smell for the time being. However, Auto Shocker goes beyond that. It tracks down all odor molecules and removes them completely - leaving your car smelling as good as new. It doesn’t matter if your car smells of rotten food, blood, sweat, vomit, fuel, cigarettes or any other stench – Auto Shocker works on everything. It is powered by chloride dioxide and a number of natural ingredients to neutralize all toxic and nontoxic smells and provide a gentle fragrance. The solution can penetrate through all porous surfaces to provide a lasting relief against odors. Even if your car is brand new and smells of leather, Auto Shocker can remove it. Since the key components of Auto Shocker are natural and biodegradable, it follows that the solution is non-abrasive. After eliminating all odors, it disintegrates into a saline solution which is easily absorbed by the leather and vinyl, without damaging them. It does not leave behind any stains either. Furthermore, the fragrance is light and does not cause any allergic reaction in human beings or animals. When shopping for used cars, most of the buyers consider skunk and smoke odors in cars as a major turnoff. If your car smells funky, your buyers are likely to either ask you to lower the price or they’ll simply walk away. Unless you invest in a complete odor removing solution for car, you are unlikely to recover your quoted price on a sale agreement. Lastly, Biocide Systems offers a complete refund on unsatisfactory performance. All our products, including the Auto Shocker, come with a 30-day warranty period. During this time, you can test it on your car. If the odors remain, let us know. We’ll get it checked by our team and issue a complete refund for your investment. To learn more about our quality-assured odor removers and why should you buy them for your car or mobile home, please feel free to contact us today! Remove Cigarette Smoke Smell - And Many Other Odors Too - With Ease. Whether you are a car owner who is looking for an inexpensive yet effective and safe method for removing unwanted odors from your vehicle - or you are a car salesman who needs to remove cigarette smoke odor from a pre-owned car truck or van, and even RV's (or any other odor, for that matter) - Biocide Systems can help! This is because the non-toxic vapors of autoSHOCKER moves through the air and eliminates odors, rather than just masking or encapsulating them. It really does work to kill the odors completely! But don't just take our word for it. Take a look at what one satisfied customer had to say after using autoSHOCKER to remove cigarette smoke odor from a car. "I acquired a car from the original owner 5 years ago. I knew she was a chain smoker and the car smelled of heavy smoke all throughout the upholstery, air vents and everywhere else. Then I got a hold of the autoSHOCKER and decided to give it try since it was so affordable. When all was said and done, my car no longer smelled of smoke. It was miraculous! It is the best and most cost effective solution I have ever seen for removing unwanted odors from vehicles." Why simply mask odors when you can remove cigarette smoke smell, as well as all the related harmful pathogens, with a highly effective product like autoSHOCKER Quick Release? With this eco-friendly option, you can remove cigarette smoke odor from a car within just hours ' and at a price you can truly afford. If you are looking to remove cigarette smoke smell from your vehicle - or pet odors, vomit, spoiled food or any other odor - use autoSHOCKER Quick Release. 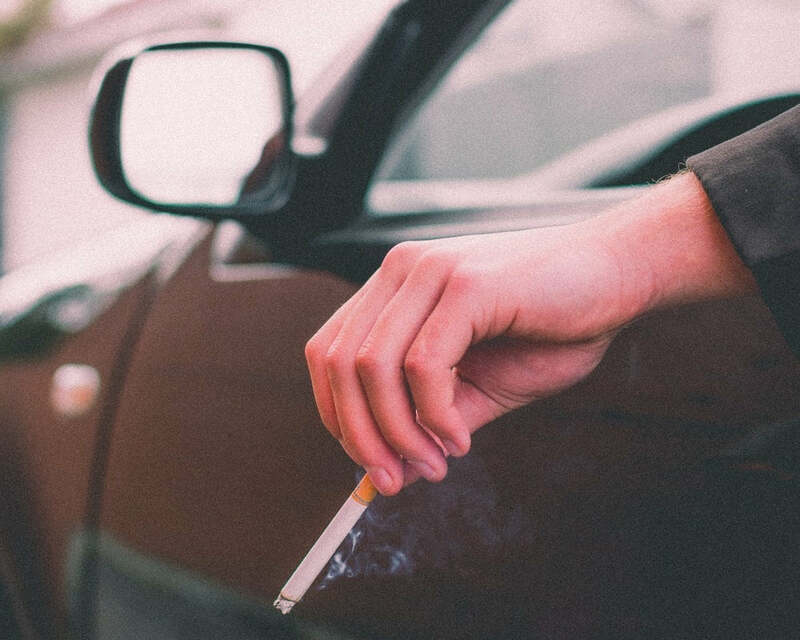 To learn more about the odor removing products from Biocide Systems - or how to completely remove cigarette smoke odor from a car - call us at (877) RX-BIOCIDE or send us an email at info@biocidesystems.com. We will explain how our proven products work to eliminate odors. Or Check out our bundles for GREAT Savings! Remove Car Cigarette Smoke Smell. Remove Any Car Odor.